Locomotion: Pacing gait with long legs; feet face forwards so doesn't waddle or walk "pigeon-toed" like other bears. Diet: As an adaptable omnivore, ate plants, scavenged carcasses and may have killed prey too. 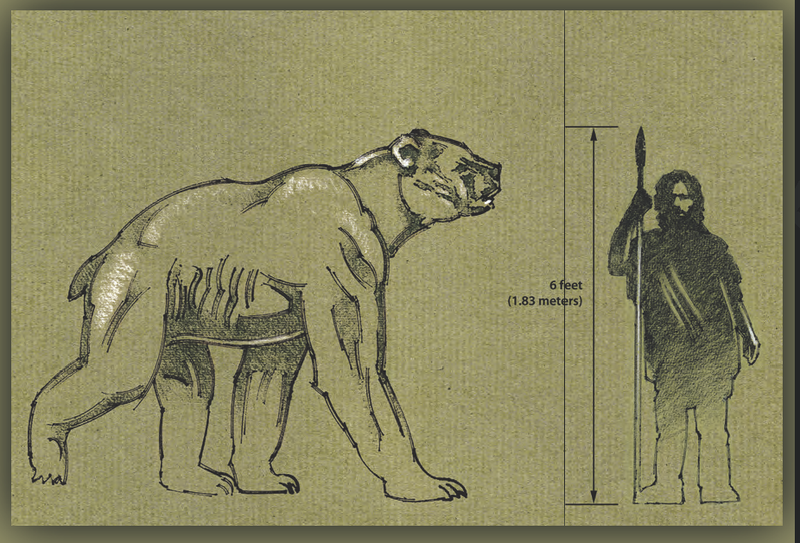 Feature Facts: Arctodus is variously described as a hyper carnivore, a specialized scavenger, and an omnivore. A new comprehensive, comparative study of 411 individuals of 57 species of living bears, dogs, cats and hyaenas and fossil Arctodus (Figueirido et al 2010) favors an omnivorous lifestyle, similar to that of Alaskan Brown Bears today. How to cite: Extinct Short-faced Bear (Actodus spp.) Fact Sheet. c2007. San Diego (CA): San Diego Zoo Global; [accessed YYYY Mmm dd]. http://ielc.libguides.com/sdzg/factsheets/ extinctshort-facedbear.